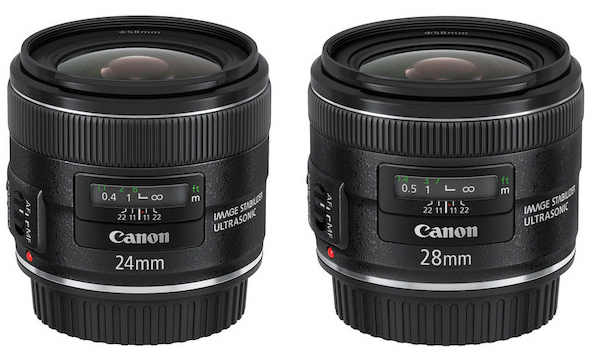 The Canon EF 24mm f/2.8 IS and the Canon EF 28mm f/2.8 IS lenses are beginning to arrive at camera stores now. The two lenses are not L lens and are aiming for a wider market where Image Stabilization is almost like an expected feature. Although IS is very helpful in longer focal length lenses, making these two lenses with IS is perhaps purely a marketing decision, as evidenced by most of Canon's lower priced EF-S lenses, which all have the label IS stamped on them. 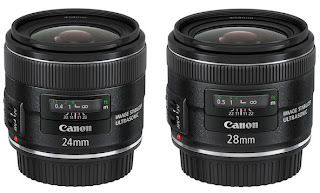 I expect the two lenses to have slightly better image quality than most EF-S lenses but some even claim their sharpness surpass the Canon 24-70mm f/2.8 L lens and might even challenge the newly introduced Canon 24-70mm f/2.8 L II lens. I doubt that unless Canon is trying to make another blunder like they did with the Canon EOS-5D MK III. Packing the EOS-5D MK III with so many features and performance and putting such a 'low' price on the camera drives the final death nail into the coffin of the EOS-1Ds MK III. Are they trying to kill the Canon 24-70mm f/2.8L II before it even hits the camera stores? This is a bread-and-butter lens for many wedding and portrait photographers. Who would buy the 24-70mm f/2.8L II if they can get equivalent performance from the EF 24mm f/2.8 IS and the EF 28mm f/2.8 IS lenses for a fraction of the price? I will get a hold of these lenses and give it a test soon. Visit my website MichaelDanielHo.com to see Travel and Wildlife photos taken with the 24-70mm f/2.8L and the 24mm f/1.4L II lenses and follow my travels on Facebook.